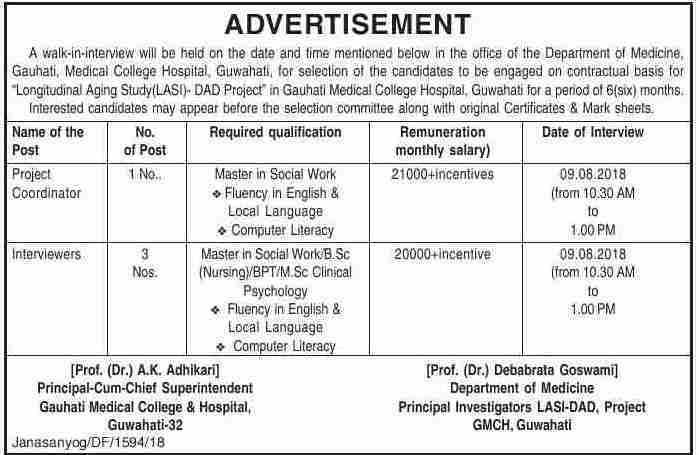 A walk-in-interview will be held on the date and time mentioned below in the office of the Department of Medicine, Gauhati Medical College Hospital, Guwahati, for selection of the candidates to be engaged on contractual basis for “Longitudinal Aging Study(LASI)- DAD Project” in Gauhati Medical College Hospital, Guwahati for a period of 6(six) months. Interested candidates may appear before the selection committee along with original Certificates & Mark sheets. Remuneration (monthly salary) : 21000 + incentive. No of posts: 3 Nos.